Joey Tribbiani is a struggling actor who lands a role on Days Of Our Lives as Dr Drake Ramoray, until his dimwitted-ness gets him fired. He is best friends and room mates with Chandler Bing and has a brief relationship with Rachel Green. He loooooves sandwhiches and pizza! Born in Massachusetts, LeBlanc moved to New York. Her birth date is July 25th. 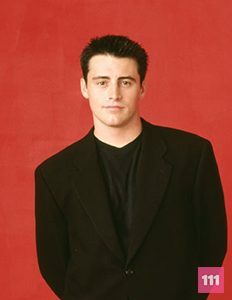 Matt LeBlanc, executive producer of the film, “Jonah Hex,” is best known for his role as “Joey” on the iconic NBC series Friends. The show aired for a decade and garnered LeBlanc accolades including three consecutive Emmy® nominations for Outstanding Lead Actor in a Comedy Series from 2002-2004 ; two Golden Globe nominations for Best Actor in a series from 2003-2004; a 1996 Screen Actors Guild Award® for Outstanding Performance by an Ensemble, and nominations for Outstanding Ensemble six consecutive years in a row, from 1999-2004; a nomination by the Television Critics Association for Individual Achievement in Comedy in 2002; four consecutive nominations as Choice Actor for the Teen Choice Awards from 2002-2205, with a win in 2002 ; and a nomination for the Kids’ Choice Awards for Favorite Actor in 2002. He reprised the beloved role from Friends in NBC’s spinoff Joey, which garnered a Golden Globe nomination for Best Actor, as well as a People’s Choice Award for Favorite Male Television star in 2005. LeBlanc’s feature film credits include Grey Knight; Ed; Lookin’ Italian; Lost in Space, produced by Irwin Allen; Charlie’s Angels, and its sequel, Charlie’s Angels: Full Throttle, with Drew Barrymore, Cameron Diaz, and Lucy Liu, directed by McG; and All the Queen’s Men.